So I’m running a little bit late today but as soon as I hit the front door last night, I got kicked in the face by the awesome weekend. Yes, I flew back home to Kansas City for the weekend. The main goal was to have great quality time with friends and family. The secondary goal was to watch some fantastic college football. Mission accomplished on both, especially for the three football games. First up, I motored on down the Sulley’s shortly after some long awaited Jack Stack BBQ, as well as a trip to pick up a Kansas State EMAW shirt, for a peep’s birthday and some Arizona State vs. Missouri. 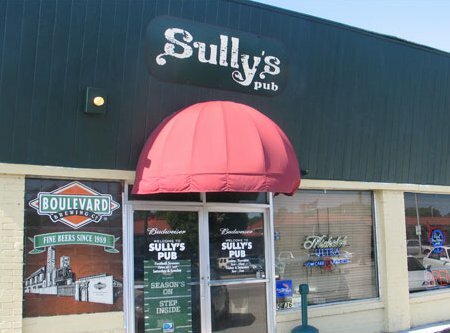 Sully’s used to JJ’s Other Place but it folded and someone even more Kansas Jayhawk leaning snatched up . The new redesign was nice but I didn’t remember much else. Football wise, James Franklin looked a little bit better but the Tigers just couldn’t quite knockout the Sun Devils. The big story was head coach Gary Pinkel trying to draw some players offside and inadvertently iced kicker Grant Ressel at the end of regulation. After a day of celebrating really hard with great friends, it was time to head to my folks for a lazy Saturday afternoon. Thankfully, Iowa State and Iowa battled for the Cy-Hawk Trophy in the middle of it. I knew that the rivalry was highly contested historically, but Iowa had the upper hand as of late. That didn’t stop head coach Paul Rhoads and up and comer quarterback Steele Jantz from pulling an epic upset victory in 3 overtimes. It seems like every year Paul Rhoads finds a way to notch a marquee victory. Pulling one out over your in state rival and gleefully ripping apart the interim Cy-Hawk Trophy marks that for me. Speaking of epic, I ended out my weekend going to an epicly tasty BBQ and sitting across from Jolly to cheer my Notre Dame Fighting Irish over Jolly’s Michigan Wolverines. The Big House lit up night lights for the first time in their history and left was wanting so much more. Notre Dame seemingly had the game in had with a little over 2 minutes to go, but Denard Robinson pulled Michigan back into the lead with 1:12 left of the clock. Notre Dame’s Tommy Rees fired right back and put the Irish back on top with 30 seconds to go. Head coach Brady Hoke went for it all and let Denard Robinson drop a touchdown pass left with 3 seconds left to win the game. That was the game of the year and it may be one of the best football games for me in the last couple of years. Although, the entire weekend of college football was the best I held witness to in a long time. Usually I’m good for one game or two when I barspot, but this last weekend had 3 consecutive epic football games. Not only did I get to watch all three, but I spent some great quality time with friends and family at each one. I’ll remember this last weekend for a long, long time.